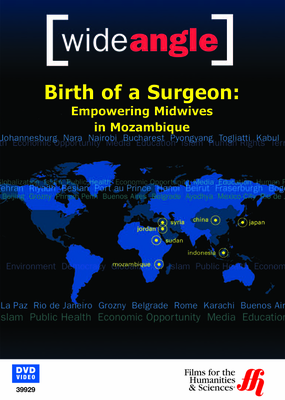 This intriguing documentary on surgically trained midwives details the steps Mozambique is taking to lower its staggering infant mortality rate. Mozambique is a developing country in Africa with an alarming infant mortality rate. Like most third world nations, Mozambique suffers from a lack of doctors and surgeons who can prevent post natal fatality for the infant and mother. The country's government has addressed this issue with an innovative training program for midwives. The Enhanced DVD follows a young midwife in training as she learns to prevent and treat issues like acute bleeding, ruptures of the uterus and eclampsia. Some of these midwives even perform Caesarian section births when necessary. This innovative approach to healthcare has garnered the attention of World Health Organization Director-General Margaret Chan. In an interview with Aaron Brown, she pledges to focus on the lack of healthcare in Africa. People are unable to demand change if they're unaware of the issue. This DVD raises awareness about a need for adequate medical professionals in developing countries. The edgy footage details the struggles women in Mozambique face when they're ready to deliver a child, giving the world a first hand glimpse. Viewer discretion is advised as some of the footage is quite graphic.